Last but certainly not the least, we now reach the last part of this 4 part series on the great chord melody players. This guitarist impacted the jazz guitar world in a way no other player has. Joe Pass is probably the most famous jazz chord melody player and one of the greatest and most prolific jazz guitarists of the 20th century. He was the most well-known mainstream jazz guitarist since Wes Montgomery. Whether it was single note soloing, chord melody, solo guitar, or comping in the rhythm section, Joe was a master of all. If you’re going to study only one chord melody guitarist in detail, choose Joe Pass – as his approaches to chord melody pretty much defined the style. Read on to learn about his career as well as 3 classic Joe Pass chord melody licks to add to your chord melody toolkit. Joe was the son of Mariano Passalacqua, a Sicilian-born steel mill worker. On his 9th birthday, Joe received his very first guitar, a factory model bought for $17. As early as 14, Joe was getting gigs and playing with people well beyond his years. A few years later he unfortunately developed a heroin addiction and spent much of the 1950s in prison. Thankfully, he subsequently overcame his addiction and returned to his guitar playing in a big way. Joe Pass ended up having a very high profile career, including long-term collaborations with Ella Fitzgerald and Oscar Peterson, as well as being a sideman to Louis Bellson, Frank Sinatra, Sarah Vaughan and others. Joe’s career took some interesting twists and turns along the way. As you can see in this video, Joe is playing mainly single lines only. His single line solos are classic bebop at it’s finest, principally inspired by Charlie Parker and Django Reinhardt. However, as his career matured Joe Pass gradually made a transition into focusing on solo chord melody guitar. He abandoned his guitar pick altogether, favouring a fingerstyle technique instead. The landmark Virtuoso series of recordings signified this turning point in Joe’s career. Listen to these recordings as they are a good representation of his approach to chord melody. Some players get put off by Joe’s guitar tone in the Virtuoso recordings, and I agree that it’s a bit rough at times. But if you look past that and listen to his ideas, you will really hear some truly groundbreaking stuff – Joe Pass took solo jazz guitar to a whole new level on these albums. The challenge with an entirely solo jazz guitar concert is keeping the audience engaged and interested. Joe Pass achieved this by using a potpourri of approaches in his arrangements: walking bass lines, extended virtuosic single note runs, surprising key changes, tasty chord phrases, and more. His playing synthesized all of this into an exciting and expressive musical form. Joe Pass was a trailblazer when it came to solo guitar playing, and defined the style that has been emulated by countless players since. Some may think that Joe Pass’ ideas are cliched – but remember that he came up with many of these cliches in the first place. Joe had such a strong sense of melody. The melodic lines in his solos are incredibly sophisticated but are always accessible to the listener – the mark of a great jazz player. He was very adept at using simple ideas and standard chord voicings, but using them in highly creative ways. The feeling you get from listening to Joe Pass is that you don’t need to have a lot of ideas in your playing to make it sound convincing, you just need to use a few ideas very creatively. Joe Pass’ chord melodies always put the melody line at the forefront. The main purpose of the chords is to support this. Joe’s typical chord melody technique was to harmonize the melody with drop 2 and drop 3 chords. I find Joe Pass’ style to be more technically demanding than that of Ed Bickert or Lenny Breau, but it’s essential to study in order to learn how to apply more stock standard chord voicings to a chord melody context. 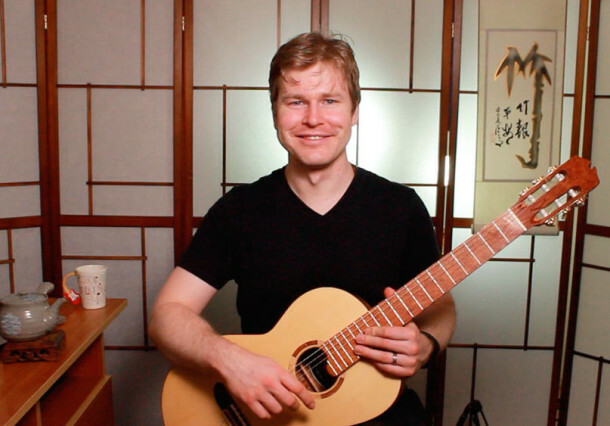 In this first lick, you’ll see pretty standard voicings, but listen out for the skillful voice leading to and from each chord. This next chord phrase is one that Joe Pass would typically use when accompanying a singer during a vocal break. Note the use of the chromatic approach chord in bar 1 and the movement from natural tensions to altered tensions in bar 2. The melodic figure on the first two beats of the next lick is a classic Joe Pass arpeggio phrase. I hope this article has got you interested to learn more about Joe Pass’ chord melody playing, whose ideas and approaches has inspired countless guitarists – and will continue to inspire many more in the future. 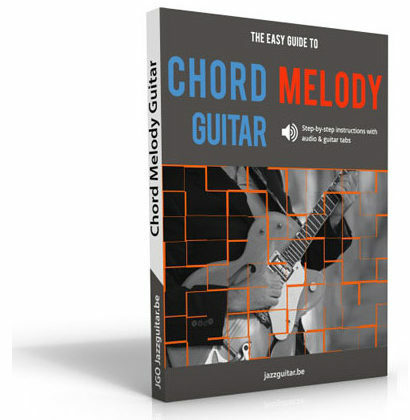 *Stop Press* New Chord Melody eBook Out Now! This brand new eBook is a complete A-Z guide on creating your own great sounding chord melody arrangements for trio and solo guitar situations, and you’ll also learn how to chord solo (i.e., improvise with chords) like a pro. Chord melody is one of the most satisfying ways to play jazz guitar. Not only does it make your soloing more interesting, but you have the ability to play all on your own without a band – an essential skill for any jazz guitarist. As you can see, each of these four jazz guitarist’s styles give you an idea of the multitude of directions you can take with your own chord melody adventure. So, check out the players and the resources mentioned in this series of posts, and give chord melody a try if you haven’t already! In my opinion, you can’t talk about chord melody playing without talking about George Van Eps. His whole approach to the guitar was heavily chordal and he was a master or chord voicing. I equate him as the equivalent on the guitar to Art Tatum on the piano as a totally individual stylist. I am sure that Joe Pass was heavily influenced by Van Eps. Joe Pass has been a firm favourite of mine for many years. And big thank you for introducing me to Ted Greene, really inspiring guitarist sad there isn’t to be more of him.